Nice cotton ruffled skirt. Good length. Only downside is positioning mattress on top of cotton material without moving the bed skirt. Perfect size, excellent quality. Fabric hangs nicely. Love it! Beautiful. Better than any others I viewed on line. Perfect fit on my queen bed, and great quality. Surpassed my expectations. Looks great! 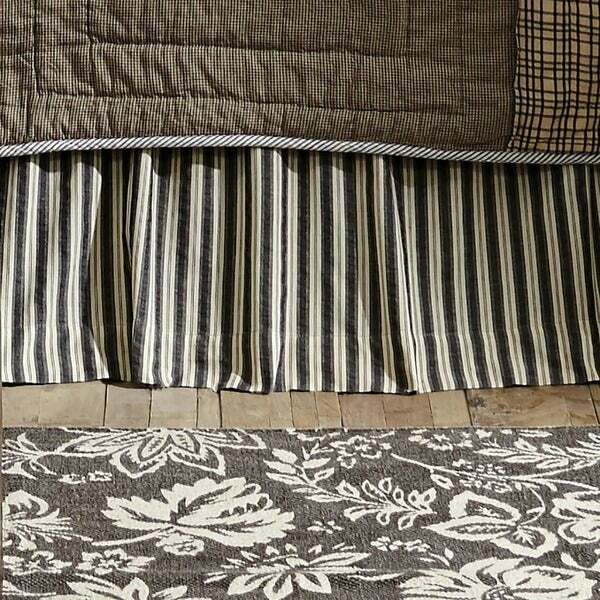 This is a well-made good looking bed skirt! The cotton material was quite nice and thick. The color did not match my bed cover so I had to return it. I thought it looked more bluish-gray in person rather than beige which I wanted. Other than the color not matching my bedroom, it was great! Lovely ticking, colors are perfect. The quality of construction and the fabric were great. It was difficult to see the colors in the picture so the bed skirt won't work in the bedroom for which I purchased it - BUT it goes very well on another bed. This bedskirt is so cute that it was worth it to me to shorten it (using Stitch Witchery fabric tape). The colors were a great match for our cream bedspread. I love it! This is exactly as advertized. It is perfect. I didn't buy this product when I bought the matching quilt and shams, but when I got them on the bed I knew it was missing that something special. 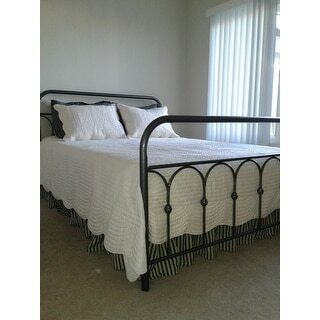 This skit is really pretty and has a simple elagence to it that completes the bed set. It looks amazing on my four poster bed. I sadly am returning this. it is very pretty but the white is a lot more cream colored than i needed. Great quality. Looks good. Goes nicely with my new sheet & comforter set! Looks so nice with my bed set. I plan on ordering another bed set and skirt to match. This bedskirt is very well-made...even the material that doesn’t show is sturdy! 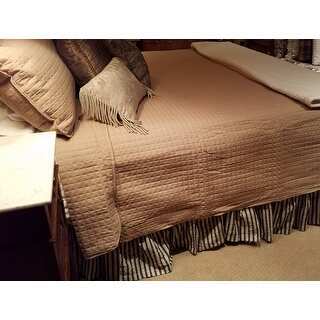 This bedskirt along with the Euro shams complete the Ashmont quilt very well and make a nice bed ensemble. Well made and good looking! It had a slight odor when opened. I placed in dryer with a scented sheet on air for 20 minute. It took out the tiny wrinkles and took completely away the slight odor. Love this bed skirt. Bought with another bed skirt so I could switch them out for different seasons. This was just as advertised. Great quality and fit and super cute! Skirt hangs beautifully without ironing. Great price—and good quality. Not like every other skirt you see that’s under ***. I was really pleased how it looked for n our iron bed. Love this quality and all! "Does this also fit a full size bed?" This is only available in twin size at this time. NO THE TWIN TOO SM FOR THE FULL BED. BUT I BOUGHT 2 TWINS. I CUT OFF THE FOOTBOARD PIECE, AND JUST USED THE SIDES, AS OUR FOOT OF BED IS ALL WOOD AND DOESNT SHOW. I USED THE PIECE I CUT OFF TO MAKE A RUFFLE AROUND A PILLOW...... THE OTHER TWININ ONE I SPIT UP AND USED AS A LONG RUFFLE AT THE BOTTOM OF MY DRAPES. I WENT INTO DETAIL HERE JUST IN CASE YOU SEW AND WANTED SOME IDEAS. THE BED SKIRT IS SO PRETTY......THAT IT WAS WORTH MAKING IT WORK !!!! !